For some platforms, Google News isn’t something that needs to be considered. However, for other platforms, this is a ripe opportunity full of SEO potential. Why? Well, aside from being at the top of a Search Engine Results Page (SERP), Google News is highly visible and offers up to date information on what users want. You don’t need to be a news platform to do this, either. If you’re in a small enough niche, you can appear when someone searches very specific, long-tail queries. For example, if you’re a local restaurant and you have news about local food events, you’re competing in a very small area and there’s a chance, if done right, Google could pick this up as news. However, Google has recently made some changes, introducing something called Top Stories. From an SEO perspective, is there anything to worry about and do we need to react? Rather than just showing a news segment at the start of a search, Top Stories offers a number of cards, complete with a title and photograph, highlighting what it believes to be the most relevant stories to this search query. Likewise, it can also sometimes (but not as frequently) show smaller cards with no images, in packs of one to three stories. Of course, this is still all within the SERP and uses Google’s typical method of answering questions – keyword analysis. Are There Any Important Changes? 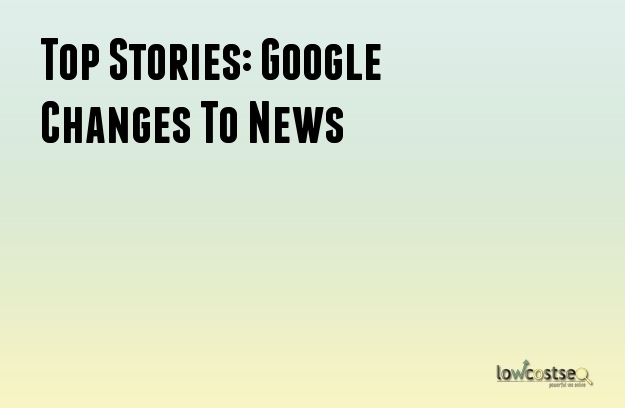 The most important change is that Top Stories is becoming much more visible than Google News. Aside from this, however, it seems to be business as usual. So long as you’re the most authoritative source of information, Google may consider you as news. While the biggest news sites on this platform are generally large newspapers, you can easily find specialist platforms, such as money websites, amongst them as well. Press releases and other publications can still be used as news, when written in a useful, authoritative manner, and these aren’t always shared on the larger news networks. One of the rumours currently going around SEO circles is that Top Stories is an attempt to fix the issue of ‘fake news’. This refers to content that is not considered news, may even be fake (such as a satirical piece of information) and, for these reasons, doesn’t serve the purpose that the original query required. Of course, one of the biggest clues is the removal of the word ‘news’ itself, but this could just be an aesthetic choice. Few fake news stories do appear in Google’s SERP results this way, but it does happen. Yet part of this is that satirical websites and content sharing the same themes often, by their very nature, share the same keywords. Google’s internal algorithms haven’t yet learned the difference, although many suspect that Top Stories is the start of a bigger push to do so. This makes sense, after all, since this was a problem Facebook had recently, and false information can spread like wildfire on Social Media. Knowing when – and when not to – pull from these sources is clearly vital to Google’s user experience.